(SL) This climate controlled custom wine cabinet provides a stunning feature within the home bar area. Dark stained wood doors with glass look through to diamond bin and individual bottle storage. To the side of the cabinet is a tasting niche with upper and lower storage for stemware and wine accessories and hidden beverage fridge. 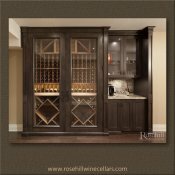 (SL) Alternative angle of climate controlled wine cabinet with dark stain. Accenting the living space, this wine lovers sanctuary is nicely nestled in the corner of the home owners family room. (SL) The lower side cabinetry seamlessly incorporates a beverage center for colder pop, water and beer. 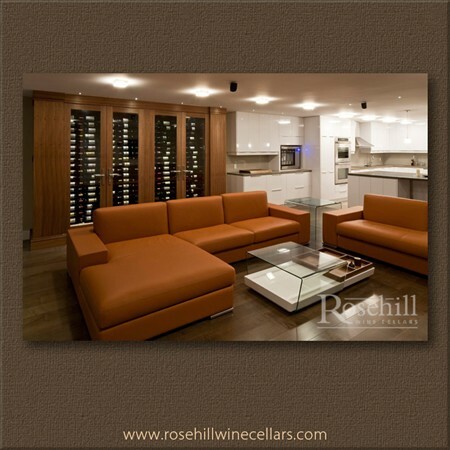 To the left a temperature controlled custom wine cabinet specifically designed for the space. 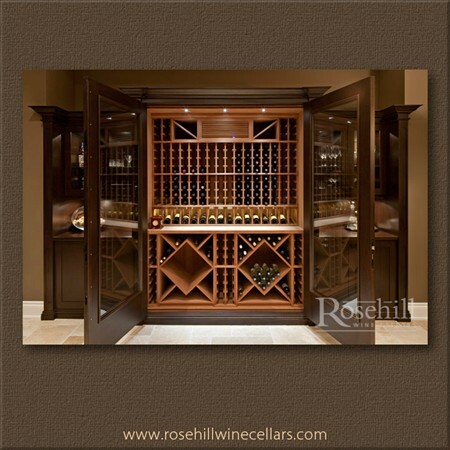 (SL) The custom wine cabinet provides wine storage for presentation, bulk storage and individual bottle storage. 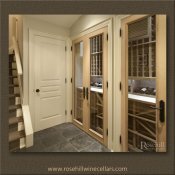 In the lower storage area, a combination of bulk diamond bins and individual single bottle storage allows for a variety of storage options for this climate controlled built in wine cellar closet. 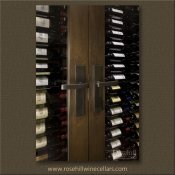 (SL) Custom White Oak wine cabinet with individual bottle storage, bulk bins and displays. 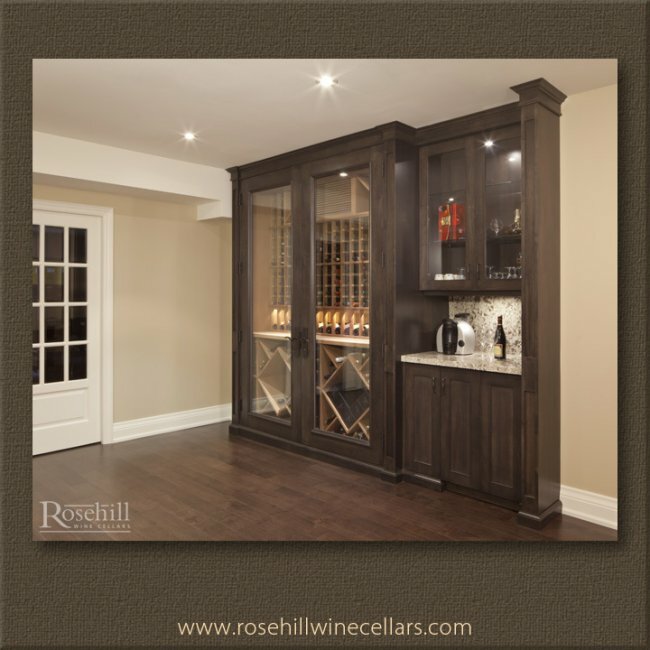 Custom made wine cabinets are ideal for narrow areas within a space. One challenge often is cooling the space, often multiple ducts may be required to ensure appropriate air flow for ideal climate control conditions. 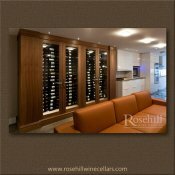 (SL)The side view of built in wine cabinet highlights the labels of wine bottles with horizontal display racking. 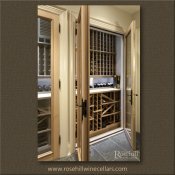 Glass in cellar allows a peak into the overall wine collection within but provides less insulation value than solid walls. 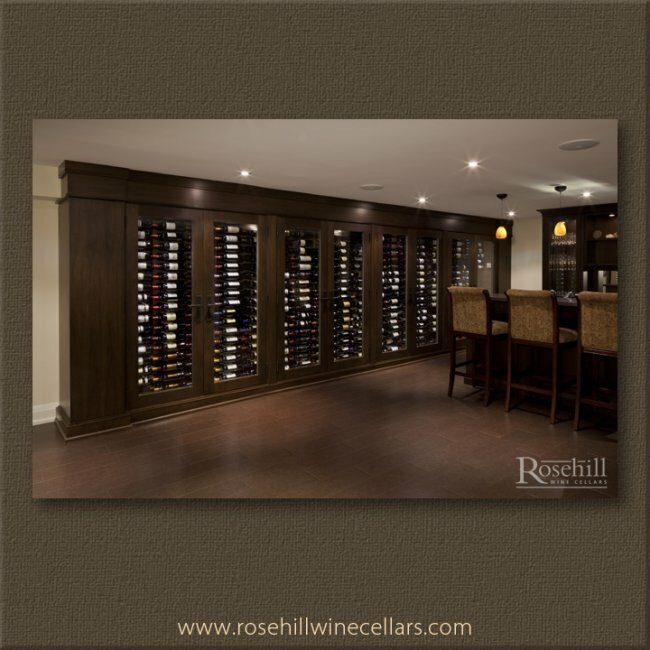 Custom made wine cabinets are ideal for narrow areas and are built similarly to an actual wine cellar. (SL) A tasting counter separates the upper and lower storage in this wine cabinet. The lower area is tastefully designed with two sections of diamond bin storage, separated by two columns of individual single bottle storage. Cooling small &amp; narrow cellars can be challenging, often multiple ducts may be needed to ensure appropriate air flow for ideal climate control conditions. 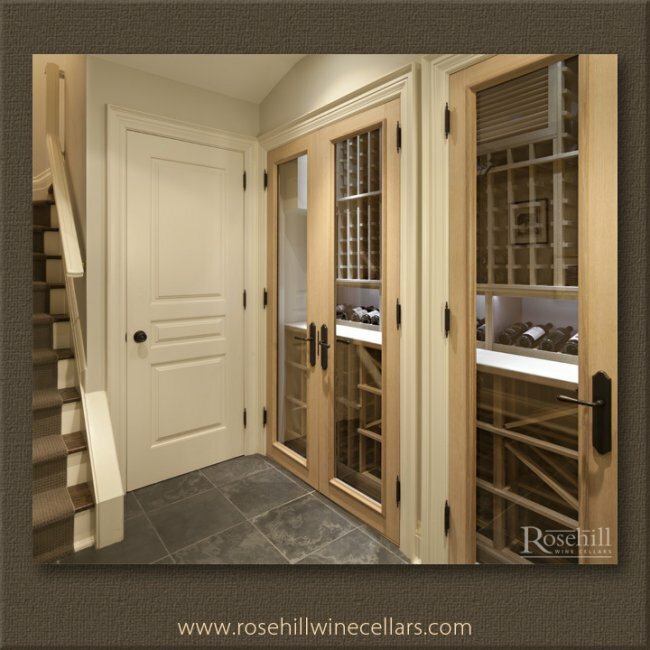 (SL) This narrow wine cellar welcomes you to the lower level of the home. 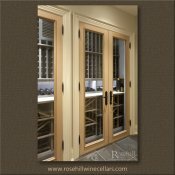 Exterior grade doors and properly insulated walls, floor and ceiling are needed to control the environment of this wine cabinet. Still holding several hundred wine bottles, this narrow cellar is an alternative to a traditional walk in cellar. Matching the custom racking, a White Oak custom grill cover helps to camouflages the cooling unit within. The rich dark wood cabinets, make up a wine wall of four sets of double door cabinets, running floor to ceiling. Custom cabinets feature exterior grade doors with rustic metal handles. 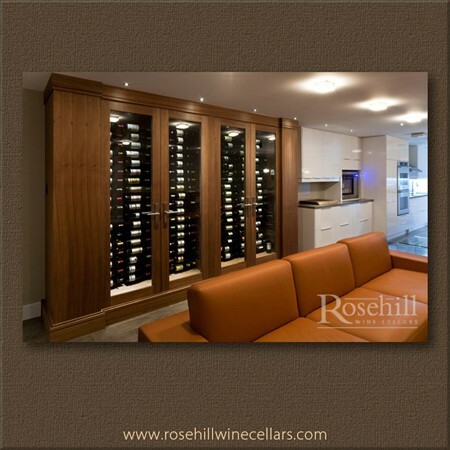 Custom made wine cabinets are ideal for narrow areas or creating an enclosed feature wall for wine storage. 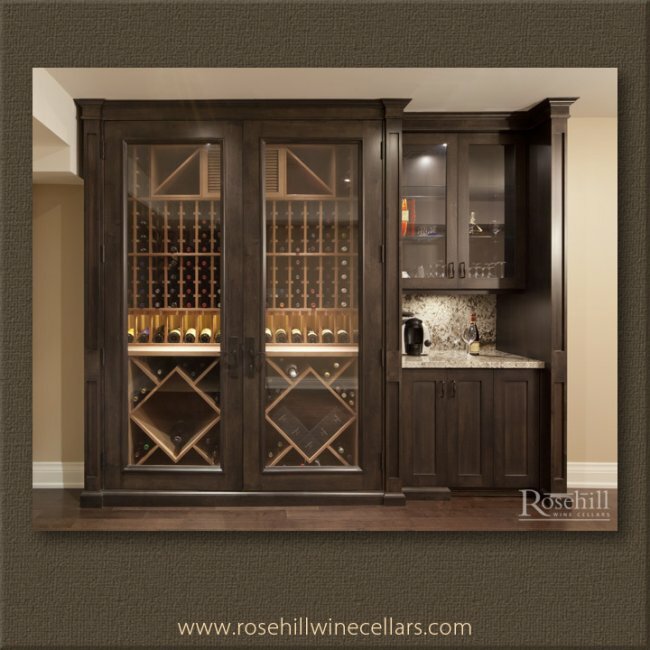 Our black metal vintage view wine racks are featured within this extra long wine cabinet. 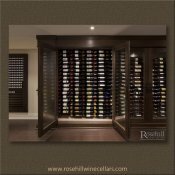 (SL) Behind the beautiful dark wood finish, individual single bottle storage runs floor to ceiling with our Vintage View Metal wine racking. This racking available in one, two or three deep showcase the label of the wine. e doors. Ductwork for cooling the continuous cabinet is in the bulkhead above. 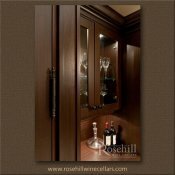 (SL) Custom made wine cabinets are ideal for narrow areas. 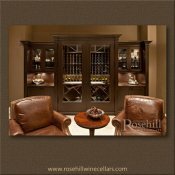 This extensive wine cabinet holds over 1000 bottles yet takes up very little space within the family room. 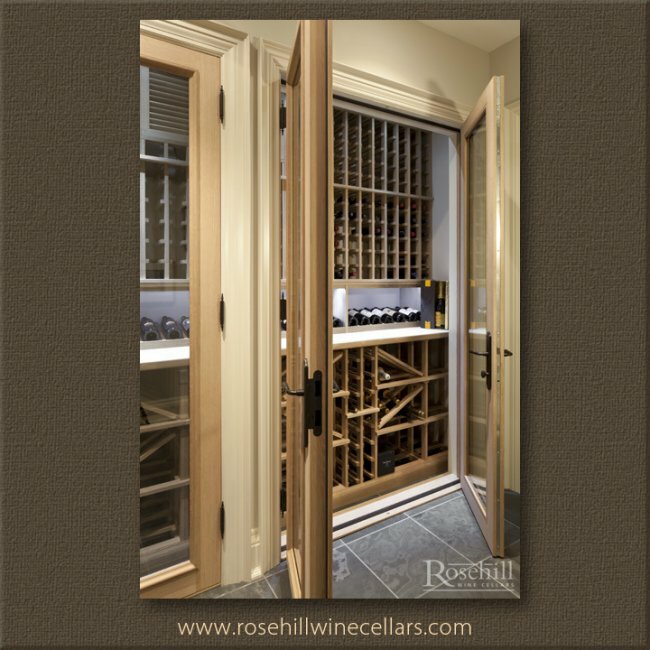 The oversized multiple doors allow for easy access to your wine. The exterior grade doors feature glass inlay and rustic black metal handles. 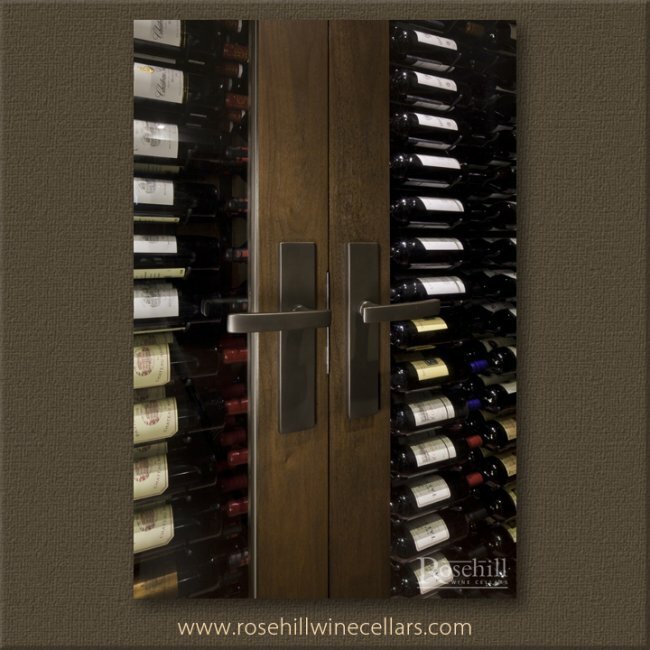 (SL) Brushed aluminum hardware with clean lines creates a sharp entrance to this custom wine cabinet. Exterior grade doors with weather stripping on all fours sides is needed to assist with maintaining appropriate climate controlled conditions. (SL) Presentation racking separates the upper and lower wine storage, in this custom white oak cabinet. Double doors with glass inlay and LED lighting provide a captivating window into this custom white oak cabinet. One challenge is cooling, often multiple ducts may be needed to ensure appropriate air flow for the ideal climate control conditions in a narrow and elongated cellar. 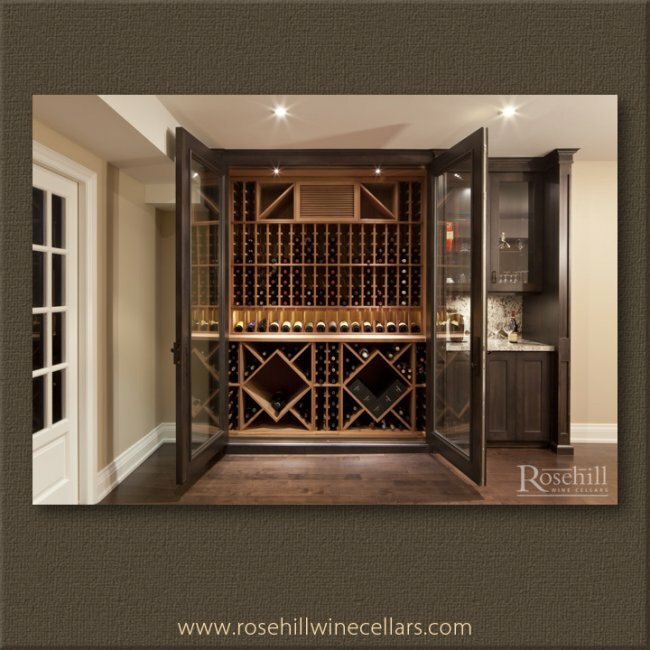 (SL) The Leaside event space for Iron Gate Cellarage features a Rosehill custom made wine display. 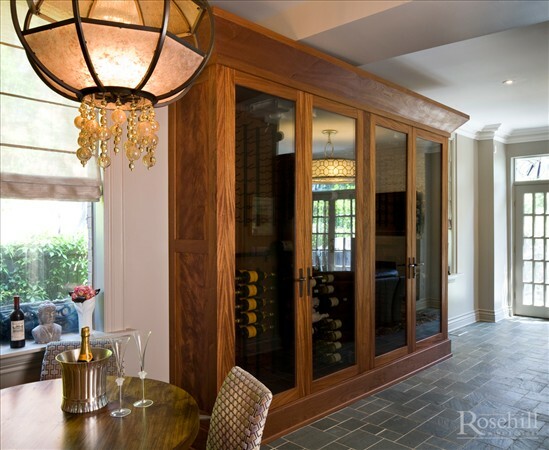 Following the length of the room, a custom three section wine cabinet takes center stage. Built to incorporate a variety of storage and display needs. 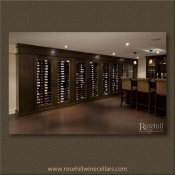 (SL) The three section custom wine cabinet features a tasting niche with diamond bins, wood case storage, serving area and presentation displays. The upper section features label display wine racks, individual bottle storage and custom display pockets for decanters or other wine accessories. (SL) Positioned directly behind the main seating in Iron Gate’s event space is a dark wood custom cabinet which adds a warm feel to private dining parties. Along with a variety of wine storage there is a variety of racking including wood case bin, diamond bins, display presentation, and individual single bottle storage. Elegant back lit custom built wine cabinet with glass doors can hold about 100 wine bottles. 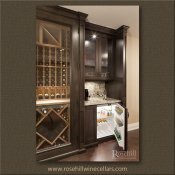 Designed with a modern peg wine racking system, this contemporary wine storage cabinet is ideal for any basement wet bar or entertainment area. Cooled with a WhisperKool ceiling mount split system. 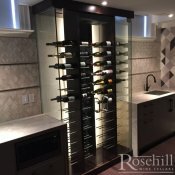 Back lit wine cabinet with glass doors. Contemporary wine cabinet built with a modern peg wine racking system can hold about 100 wine bottles. 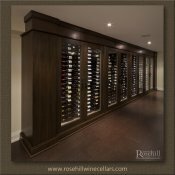 Cooled with a WhisperKool ceiling mount split system this custom wine cabinet is perfect for any basement wet bar or entertainment area. (SL) The built in wine cabinet was built into nook in one end of the family room. This four door cabinet incorporates three deep metal racking in the upper storage area. Lower wood racking is double deep to allow a counter top running the width of the cellar. Exterior grade insulated doors with glass inlay and metal door hardware provide the entrance to this custom cabinet. (SL) The walnut four door custom cabinet provide a home in this narrow space for this wine collector. 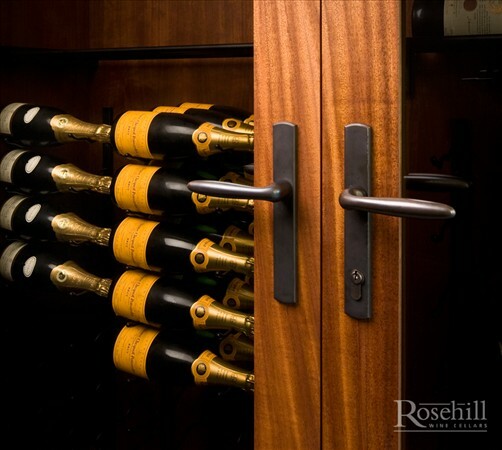 Furnished with exterior grade doors and glass inlay each door maximizes showcasing the bottles within. A clear view is presented to the interior black metal racking system in double and triple deep configuration and presentation rack separating upper and lower bottles. Double high base moulding and oversized crown, finish off the custom cabinet. 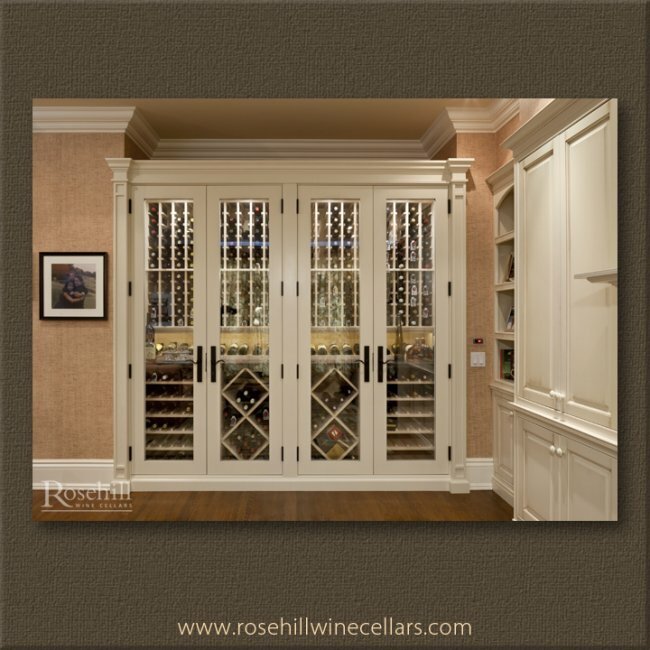 In narrow spaces, a custom wine cabinet can provide a world of options for a wine enthusiast. In this case the home owner choose to go with metal racking for their storage needs and active living space. Cooling system and ductwork is hidden within the larger crown moulding above this custom wine cabinet. (SL) Cabinet doors are furnished with metal handles that accent the rich wood cabinets beautifully. 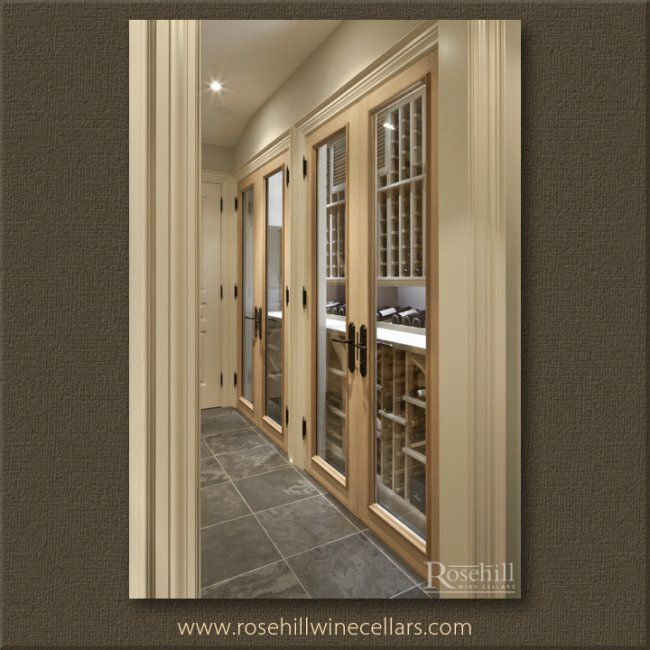 The custom wine cabinet is finished with a series of exterior grade glass doors to showcase the wine within. This cabinet houses champagne and other wines but has lots more space to hold many more bottles as the collection grows. 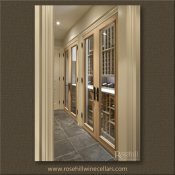 (SL) When a proper wine cellar wasn’t possible a nook in this family room, was a perfect choice for a climate controlled custom wine cabinet. 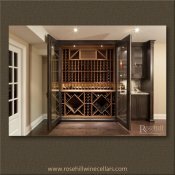 Centering the space is a two door custom wine cabinet with a wine cellar cooling unit in upper area. The wine cabinet is fitted with exterior grade glass doors. Interior wine racking features diamond bins, individual bottle storage and display racks. The two side cupboards are not cooled but complement the space for storage of wine glasses and other wine accessories. (SL) Dark stained wooden cabinet of varying depths was custom made for this space. 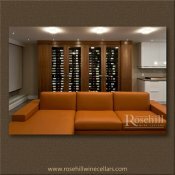 The centred area is refrigerated for wine storage and the outside cupboards on either side are not climate controlled but provide valuable accessory storage Each side features upper and lower custom millwork and counter tops. The custom cabinets also feature extra depth, detailed crown moulding and LED lighting throughout the very large custom cabinet. 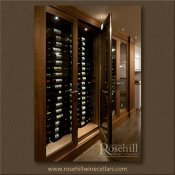 (SL) The open doors of this designer wine cabinet showcase the wine racking within. 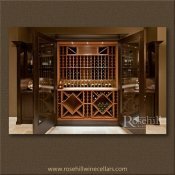 The upper area features individual single bottle wine storage and the lower area features two solid diamond bin sections all in redwood. The storage areas are seperated with a counter top and presentation display racking for featured bottles. 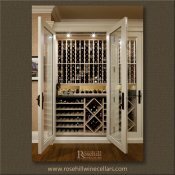 Wine cellar cooling system is hidden by wooden grill in the upper section of the cabinet. 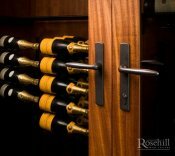 (SL) The custom wine cabinet is fitted with exterior grade doors and locking black metal handles. 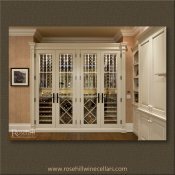 The glass doors allow view of the wine collection and create a focal point within the family room This cabinet is an ideal replacement where a walk in wine room was not possible. (SL) This close up image shows with detail in both the chosen hardware and millwork for this custom cabinet. Adding to the rich look, the dark cabinet has dark metal door hinges and handset. The upper area of the custom wine cabinet is finished with extra deep crown moulding, for a more substantial look. 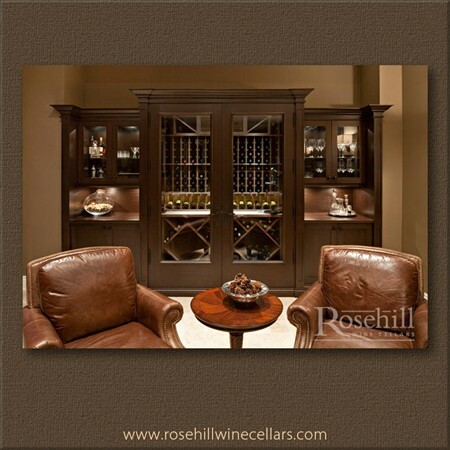 The side panels of the entire wine cabinet are set back to create interest and depth. 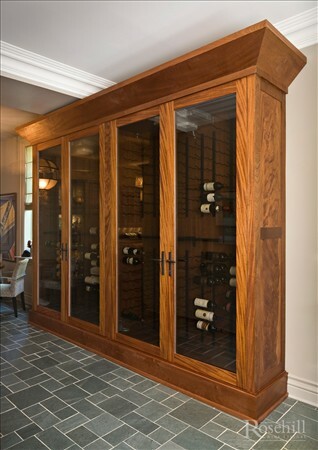 (SL) Featured in this modern living space is a climate controlled custom wine cabinet in walnut. 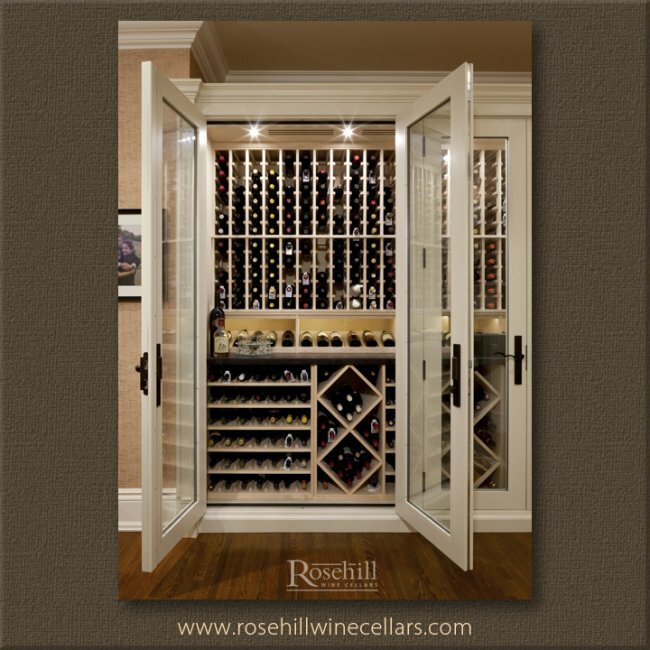 The four door wine cabinet is ideal for maximizing wine storage in a narrow area. The wood stain on the walnut complements perfectly the burnt orange on the couch. The minimalist décor let the focal points of the room speak for themselves. 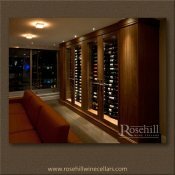 (SL) Exterior grade doors are used for this walnut custom wine cabinet within a residential condo. The doors are furnished with metal handles with glass inlay and blend perfectly to a more modern decor. 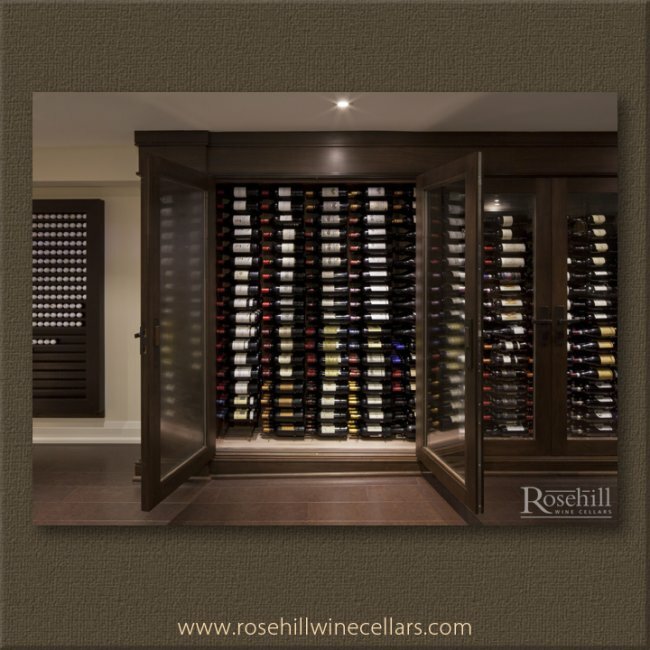 The custom wine cabinet is an excellent example of maximizing wine storage into a narrow area. (SL) The walnut custom wine cabinet provided extra deep base and crown moulding to further accent the cabinet. The outer left and right facade is created with a look of two columns and cleverly hides the wine cooling system within. Inside the wine cabinet is metal racking to provides storage for the wine collection. (SL) The four door custom cabinet in walnut features two sets of exterior grade double doors with glass inlay. This finish provides a crystal clear view to the wine collection and the view out the window is equally as spectacular. 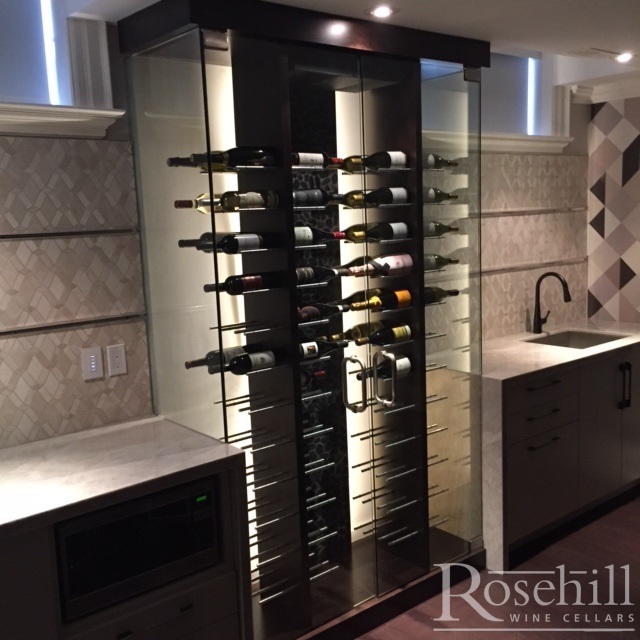 Highlighting the collection, led lighting is used inside the custom wine cabinet and within the condo. 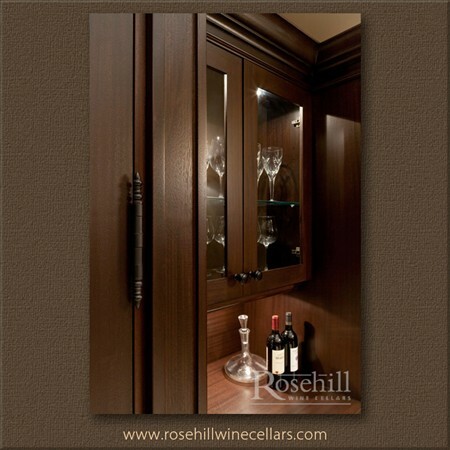 (SL) Custom made wine cabinets are ideal for narrow areas. 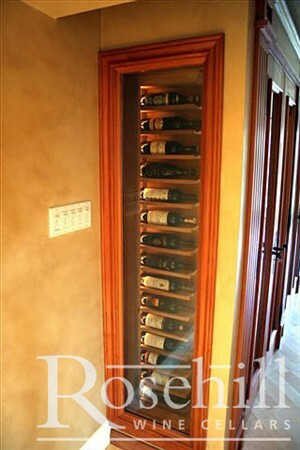 This image shows how the glass door provide both look and function to secure the wine. 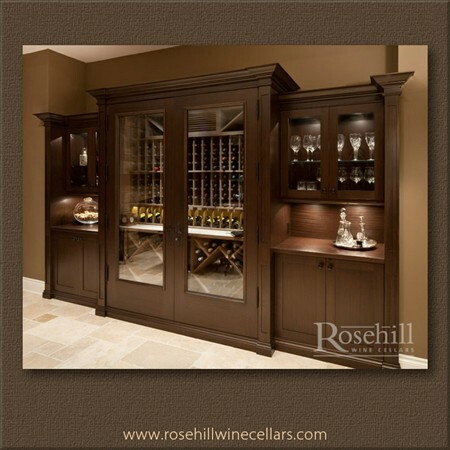 The wine cellar cooling unit for this cabinet is housed in the decorative wood trim sidelights of the cabinet. This custom cabinet cooling unit duct vents are perfectly camouflaged with two sets of vents grill covers in both sections of custom cabinet. (SL) A stunning six door custom made wine cabinet with custom detailed molding fits this narrow area perfectly. 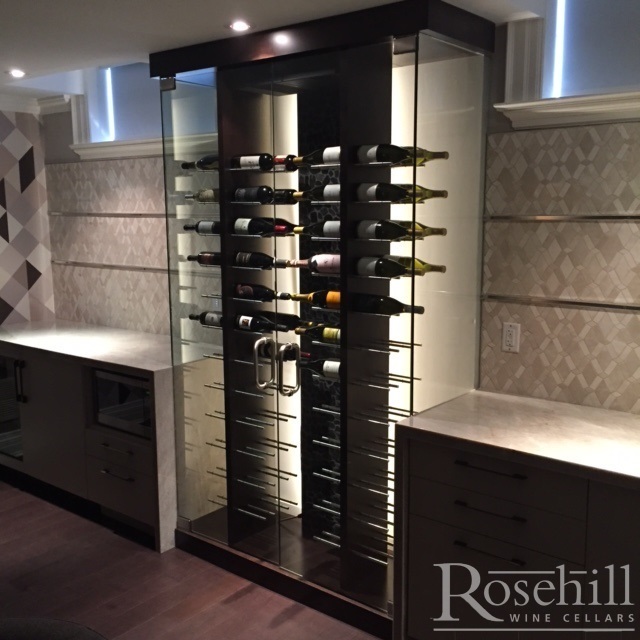 This climate controlled area is a great example of how custom wine cabinets are ideal for narrow spaces. One challenge is cooling, often multiple ducts may be needed to ensure appropriate air flow for narrow spaces. 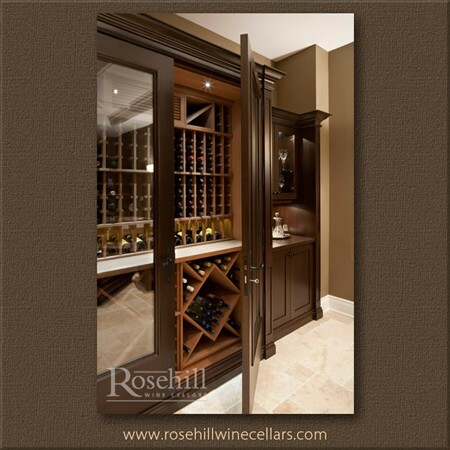 (SL) In this narrow space a six door custom wine cabinet provides everything a wine owner needs. 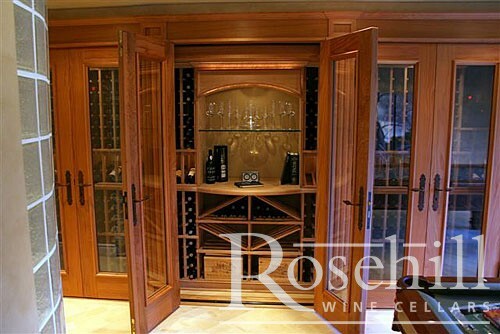 The middle set of doors open to this magnificent inset tasting niche, with a glass shelf displaying glassware. 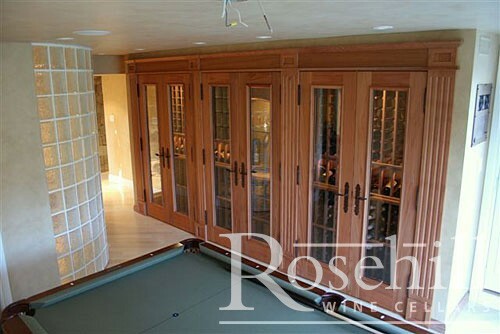 Wood wine racking is customized to fit the space and owner’s collecting style. 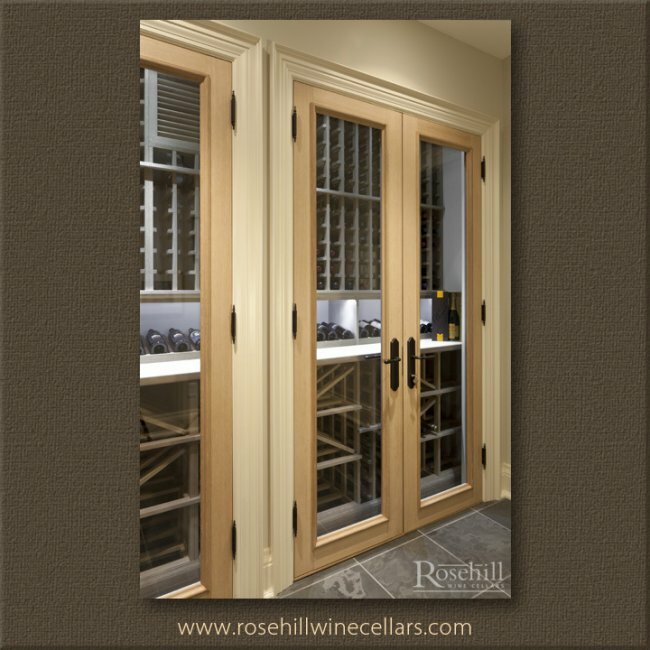 Exterior grade doors with glass inlay and rustic metal handles accent the rich look of the custom wine cabinet. Below the niche, a combination of diamond bins and wood cases bins provide easy access to the collection.